I have to admit, I'm having a hard time just now with new blog posts as I have seemed to lost the urge to try new to me craft and not so craft beer since I have started brewing my own. I do have about 30 untried and untasted stashed away so hopefully I can start churning posts out again, certainly 'she who must be obeyed' will be pleased as I seem to have beer everywhere at the minute. Having a fermenting vessel in the kitchen and one in the bedroom is doing me no favours whatsoever on the wife acceptance factor scale. Writing blog posts describing how good..or bad my own beer is is not my style as apart from family and friends no-one else is going to taste it so what is the point ? I will say though that my own version of a vienna seems to be a real winner with a few colleagues at work wanting to buy a case load. So, on to this one which I noticed started appearing in kiosks and supermarkets a couple of months ago. I have no idea if it is a re-release as information is sketchy. If it is anything like Carls Porter then I'm onto a winner. It still makes me wonder why they don't export beer/brew it in the UK like that one. Coming from Scotland my initial impression of Carlsberg was cheap lager pishwater or cheap lager pishwater aimed at alcoholics(special brew). 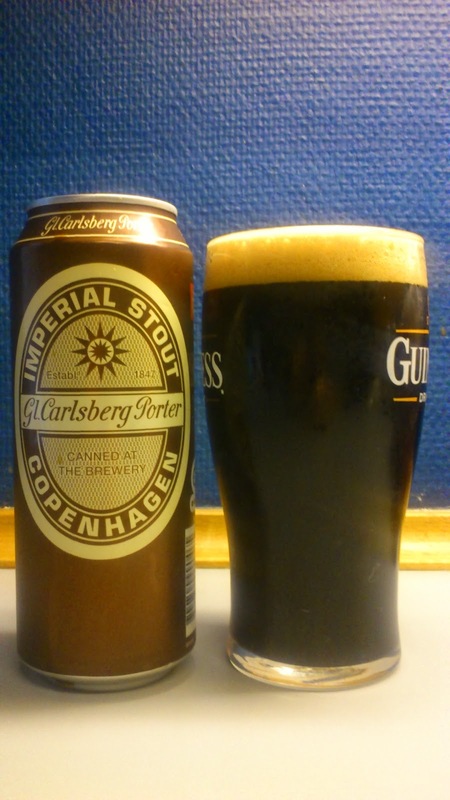 I do not get why they do not try to change the image and at least release one of the stouts/porters or any the better ones from the domestic danish market over there...ok, the last bit I might have took too far :). Gamle ( Gam-le) = Old. Right, let's get cracking..
Wafts of roasted malt, licorice(arrrggghhh) and raw cane sugar from the pour. This Imperial Stout pours pitch black with a beige to brown head. Sweet intake with dark roasted malts which are almost smokey like, chocolate, toffee, plums and only a dab of licorice(pheeew) which lead into a roasted bitter finish. Dark fruits, berries and chocolate linger in the short aftertaste. Lowly carbonated, the mouthfeel is quite rich and creamy. Although you can feel the presence no alcohol shines through. What a cracking VFM beer. I think I like this better than the afore-mentioned Carls porter, though I think it fall short against it's cousin Wiibroe, which coincidently also is 8.2 abv, hmmm...though it is a different recipe as they don't taste the same. I have absolutely no problem buying this and drinking again. Summing up, one of them beers that if it had a fancy non-macro label it would be marked up. This scored 8/10 on the 'don't tell anyone who makes it, pour it in the kitchen, dish out and let people make an arse of themselves' Beerometer. Where to buy CPH : Basically anywhere. now looking for the correct fluid contents... which is how I found your blog. Sounds very moreish to me. t'wife et moi are currently researching dark Winter brews. but their range is limited! and certainly not long on finish! The four bottles on the right of your header would be a good starting point!! but the local shops carry local and nearby products. and two non-Bio... none over 4€! but haven't seen Pelforth's anywhere... yet! !